As predicted on page 198 of my magnum opus, A Mermaid in the Bath, as of 14th September there will be a picture of Jane Austen on the ten pound note. This is a further demonstration of the inspired nature of my oeuvre. ...Half way through Milton addresses himself to you with the words ‘gentle reader... .’ Who does he think he is, Jane Austen? 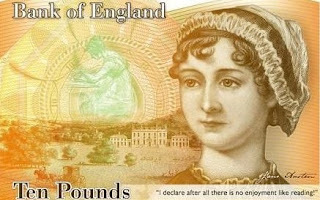 Anyway I hope they put her picture on the banknotes as it’s about time we had a woman on there. Mind you the Queen is on all of them isn’t she? Talking of Jane Austen, that would have been a good name for a car in the heyday of the British Motor Corporation, instead of the Austin Cambridge, like. Then the Morris Oxford would have been Jane Morris. As you no doubt know, Jane Morris was the muse of the Pre-Raphaelites. It must be nice being a muse and getting all that male attention. Goodness, this Argentine wine is good! I’m feeling quite inspired now. Perhaps I’ll write that bodice-ripper myself and then I can ask Milton to help me with it while I snuggle up to him. Once I’m back in England. And I’m not living in a shed at the back of the Co-op. He’ll have to get a proper house.